Article Shared with permission of Rob PIncus . When I’m scheduled to be a guest on Armed American Radio and don’t have anything in particular to talk about, Mark Walters often sends me links to current event type stories that he’d like to discuss or get my opinion on. Late yesterday afternoon, he did just that. The link he sent me was to the following news story about an armed “good samaritan” who stopped an assault on a woman by holding her attacker at gun point until the police arrived. You can read the story and view the video, HERE at the local CBS Affiliate Website. Naturally, this story is right up the alley of Personal Defense and Concealed Carry Weapons topics that I often talk about on AAR. 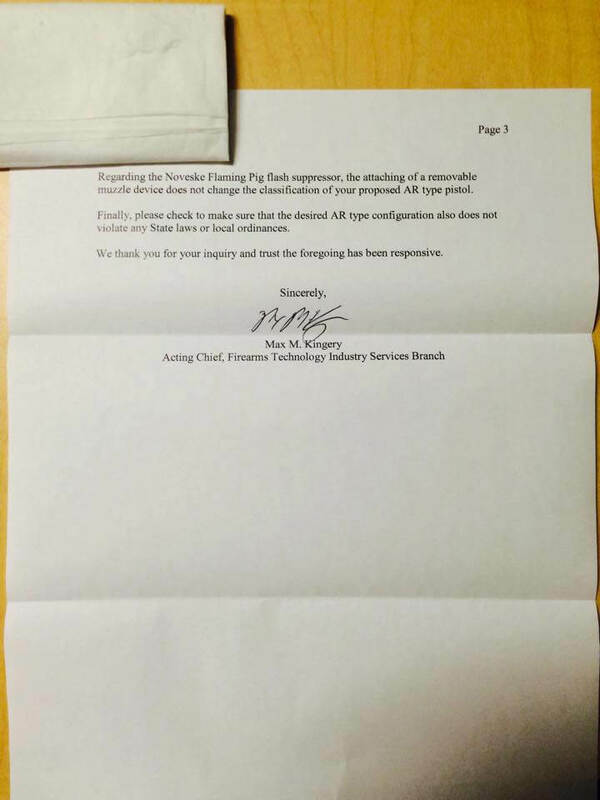 In fact, this exact scenario is one that we recent talked about on various social media pages, after we published a training video on the topic of Using a Firearm to Detain a Person at Personal Defense Network. It is also something that we have addressed in I.C.E. Training Company‘s Home Defense and CCW Courses as part of our “Immediate Aftermath” Scenarios. Based on reading the story and watching the video, I commented on the incident and what I saw in the second half of the second hour of Armed American Radio last night, which you can Listen to HERE: AAR, 12/28, 2nd hour. My comments begin about 35 minutes in. Shortly after the end of my segment on the show, I got a few private messages letting me know two things; First, I knew the Good Samaritan that was the subject of the story… at least through interactions on social media. Second, That he, Aaron Kreag, had already made a public statement (via the same CBS News program) as a follow up to the initial story. Shortly after becoming aware of those facts, I saw that Aaron himself had commented on a post in the I.C.E. Training Discussion Group and offered to discuss the incident with me. We quickly set a time and I had a chance to discuss the incident with him for about an hour earlier today. In the meantime, there has been an avalanche of typical internet assclownery from the code-name heroes in various forums and even in yes-I’m-saying-this-with-my-name-next-it Facebook Comment Threads. Most of the real embarrassing stuff comes from the contingent of our community that would kill ‘em all & let god sort it out… these guys are all wishing that Aaron would’ve gone Full Vigilante and pulled the trigger. The other silly side of the cacophony is saying that he had no business getting involved, one commenter even going as far as to characterize the man beating the woman as a “marital dispute”! After talking with Aaron about the incident and hearing his detailed descriptions of both his actions and that of others involved (the attacker, the victim, his wife and the police), I can tell you that he acted within 5% of exactly how I would want one of my students to have acted, once the decision was made to get involved. 1. He saw a very brutal attack taking place in a vehicle adjacent to his on the side of the road. He described it to me as if a 200+ lb UFC Fighter were kneeling over a defenseless opponent no longer capable of defending themselves raining down punches and elbows with the referee doing nothing to intervene. By the time he was in a position to see clearly what was happening and actually intervened, the male attacker was out of his car seat, overtop of the much smaller woman in the passenger seat. 2. He had his wife call the police before he even left his own vehicle or drew his own gun. 3. He had to position himself where the attacker would see him so that he could try to use verbal commands and a show of force (the gun) to get him to stop the attack. 4. He also had to position himself so that the victim would not be in his line of fire if he did feel the need to shoot and so that his wife would not be in unnecessary danger should the attacker have pulled a gun and started shooting at him. 5. He gave clear verbal commands and demonstrated trigger discipline (even showing his finger OFF the trigger to the attacker to try to calm him down in the middle of the incident) through the event. 6. When the police were arriving, he consciously brought his gun back to the high-compressed ready position to appear less threatening, but remain ready to defend himself if necessary. 7. When the police arrived and began giving him commands, he immediately complied completely. 8. He identified himself as being legally armed. 9. He let the police investigate until witness statements and physical evidence had established that he was the “good guy”. 10. His education in the legal use of force served him well in regard to his articulation of why he did what he did during the police interviews that followed the incident (both immediately and a few days later). During our discussion, it was clear that Aaron was still processing some of what had happened. Having discussed these types of incidents (shoot and no-shoot versions) with scores of people and watched scores more video’d statements, this is pretty typical of a situation that was so recent. Aaron was very clear about the important parts of what he saw that prompted him to take action. he was also very clear about his very high level of focus on what the attacker was doing and less awareness/interaction with anyone else (victim, bystanders, etc.). He also drew an interesting distention between his emotional/instinctive reactions during this incident in which he took “on balance” action to insert himself as a third party witness to violence and situations he recalled from his military service when he was the target of potential harm. He said that he had a clear “Now What?” moment when he realized that the immediate threat to the woman had stopped and that he was standing in the middle of a street with traffic backed up and bystanders all around him and a gun in his hand. He found out later that one of the many 9-1-1 calls during the incident had described it as “a white man in a gray jacket trying to carjack a black man in a red car”! Having not done any specific scenario training for that moment, he was left to improvise the rest of his response. A reminder that we need to go beyond marksmanship skills if our intention is to train for personal defense. Of course, the training Aaron had as a combat medic and flight paramedic contributed well to his ability to think quickly and act responsibly under stress. It was a very frank and open conversation that I thought reflected highly of his integrity. Aaron was even very clear about the things that he would’ve done differently if it were to happen again tomorrow… a sure sign that he isn’t responding with ego and bravado dictating his words. He’s even rethinking a few things, possibly including his choice of carry gun, that may affect how he trains and practices in the future. I’ll even add that I think Aaron is precisely the kind of guy we should want speaking about this incident and representing our community of responsibly armed citizens. In the past few years, we’ve had over-zealous community-watchmen, bloodthirsty frustrated neighbors, anti-government conspiracy mongers and several other dubious characters getting way too much mic and camera time with the media supposedly representing American gun owners. Aaron is a confident & well spoken family man and military veteran. He has been an active contributor to online discussions about training and is an active competitive shooter as well as being dedicated to developing his defensive shooting skills. Although he doesn’t actively teach, Aaron is also an NRA Certified Instructor and has been certified to teach the Texas CHL Course. Could we find out tomorrow some embarrassing facts about him? Could he turn into a loudmouth disappointment? Sure, I guess… but I’m betting against it. 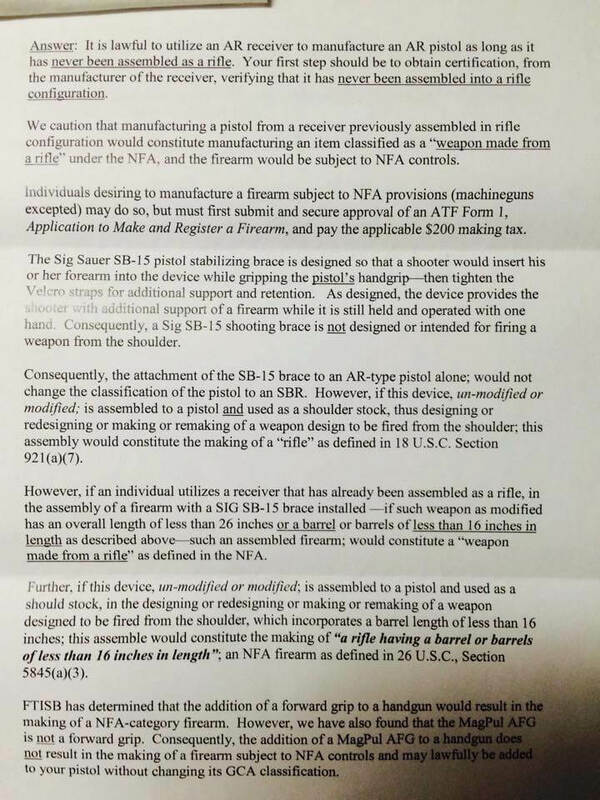 As I said initially on Armed American Radio, the judgement of whether or not Aaron should have gotten involved is one that I hesitate to make and caution others against making as well. These are very subjective situations with a million variables. It sounds like this is a situation that I might have gotten involved in myself, though I can think of circumstances which would’ve prevented that as well (such as being with a very young child who might be exposed to danger at the time). I can understand why someone might say that they would or would not have taken similar actions… but, I cannot understand why anyone would arbitrarily say that Aaron was wrong to have taken the actions that he did. I think it is even worse that anyone might second guess his decision not to shoot and merely use verbal commands and a show of force to get the actions to stop. It is certainly possible that had he shot and killed the attacker, the physical evidence and witness statements would’ve justified his actions, but having been in those “could’ve shot” situations myself in the past, I consider it the highest sign of the responsible control of lethal force that he didn’t shoot because he didn’t actually perceive the need to do so. It is a classic example of what I refer to as the “Should versus Could” issue. 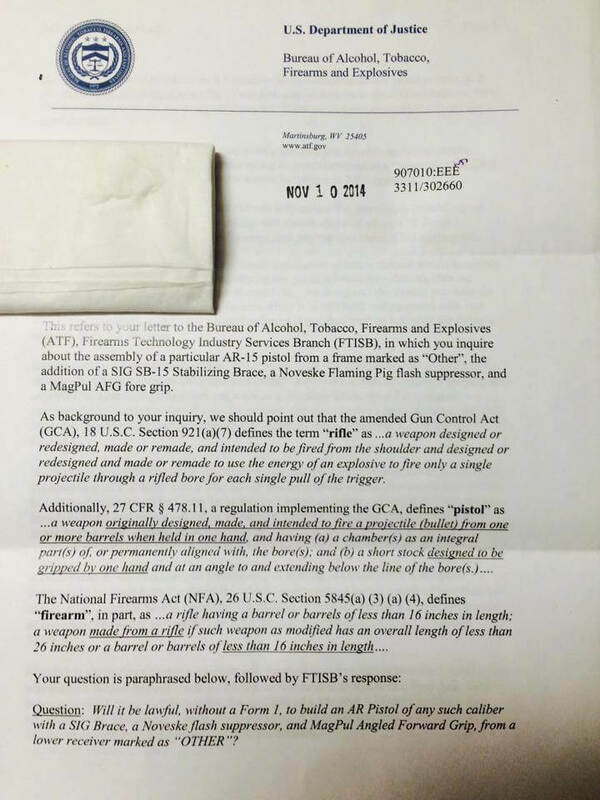 One of Texas based Combat Focus Shooting Instructors, Aaron Israel, has also written an article about this incident that covers the details of related Texas Law and his own thoughts on Aaron’s tactics. It is definitely worth a read. None of us should want to live in a society where people refuse to get involved because they fear solely for their own safety. None of us should want to live in a society where people roam the streets looking for opportunities to use force against their fellow citizens without regard for solid observation, critical thinking, their own safety & that of those around them and the rule of law & due process. Somewhere between these two scenarios is the society that most responsible gun owners want: One where the evil that exists in this world is tempered by good people with the training, tools and willingness to act prudently on behalf of good. In that society, there is less evil. In that society, those who would be bullies, predators and violent criminals hesitate to act for fear of the good guy with a gun. And, sometimes in that society, as it was in Southlake, TX on December 26th, the Evil that acts out is stopped, a victim is protected and there is less bloodshed instead of more… even when a gun is brought into play. One of the above pictures show a keyhole, another one shows a cloverleaf. While I was in the Marine Corps, the terminology had at some point gotten mixed up. Our instructors in boot camp would call cloverleafs keyholes. I forgot about that till much later. About two years later, one of my peers, was reading a book on aircraft maintenance. 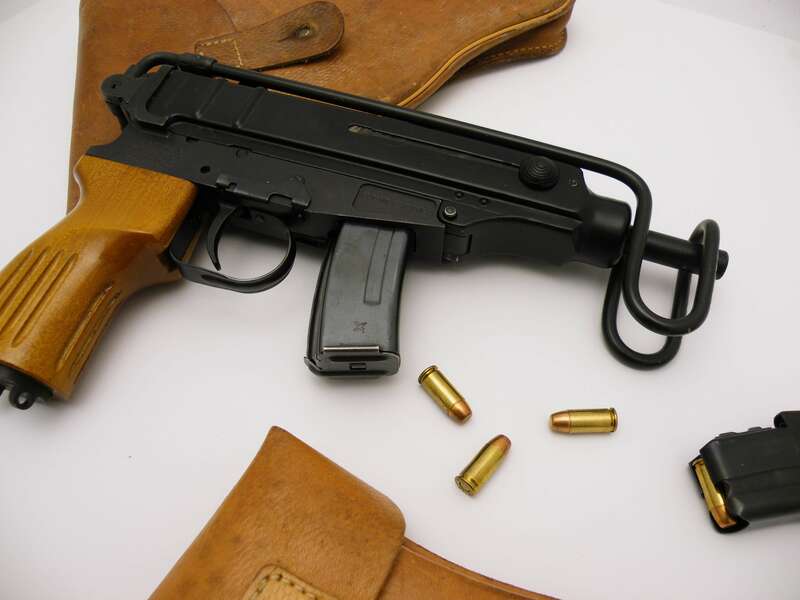 It stated that to check the barrels on the machineguns on the aircraft, you set up a plywood board and fire at it. If more than half the rounds keyholed, you would replace the barrel. This guy was astonished. He came to me and asked me why would you replace a barrel when half the rounds are going into the same hole? So I had to explain what a keyhole really is. A keyhole is when a bullet strike the target sideways. Usually because it is unstabilized and tumbling. The top picture shows two 75 grain .223 match bullets fired out of a M16A1 barrel at 25 yards. Notice that both struck the target sideways. However both struck very close to point of aim. A cloverleaf is where you have multiple touching impacts. 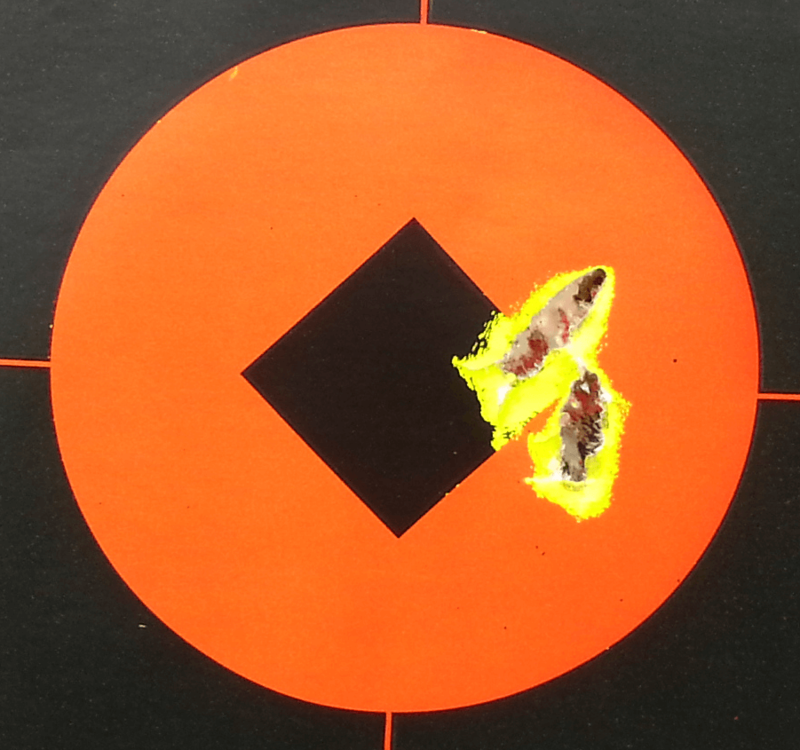 The bottom target shows five 9mm rounds fired at 7 yards. The bottom cluster of three shots would be called a cloverleaf. 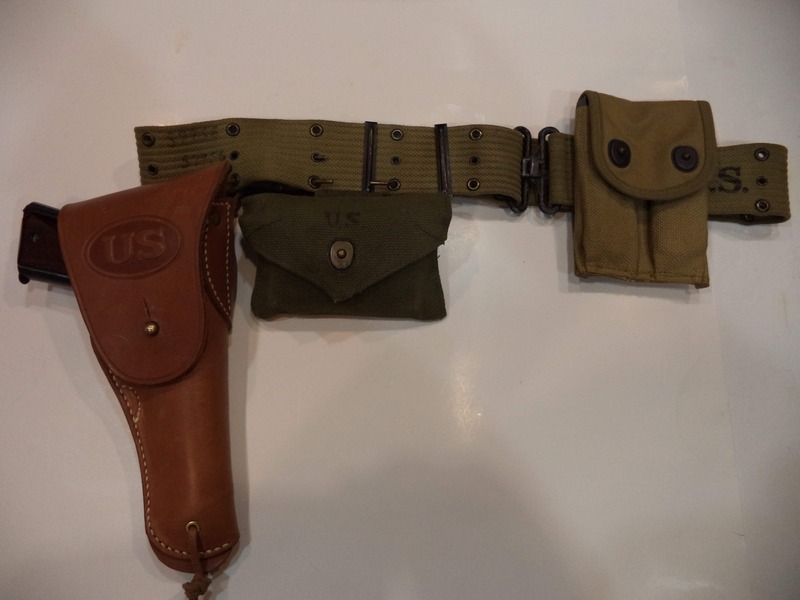 I am not exactly a collector of WW2 gear, but being a devoted worshiper of the Colt M1911, I have always had a love for the old nostalgic web belt, brown leather holster and accessories that came with the issuance of the 199 during the war. 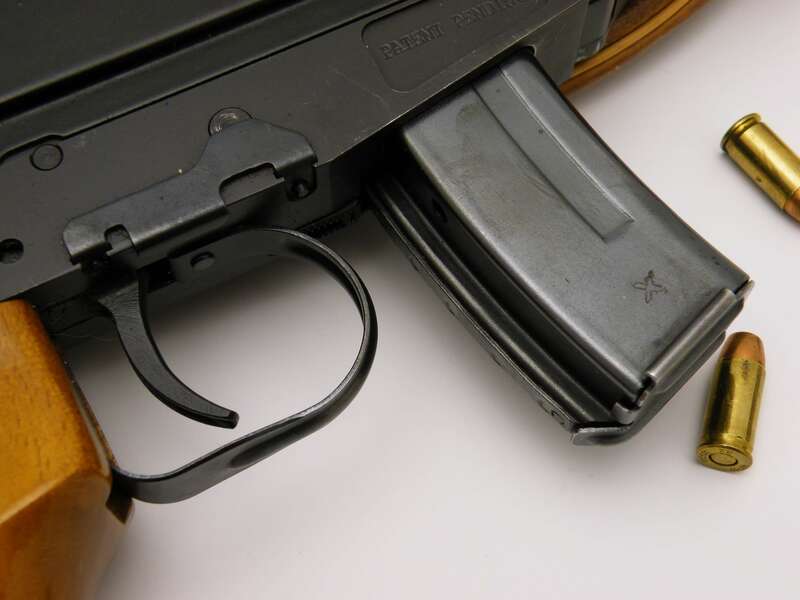 the belt was set up with what you needed to support the pistol in garrison or the field and more was added to it as needed via the 1910 wire hangers most of the gear used at the time. The belt and pistol was a sign of authority and prestige, When you saw a soldier with the gun and belt, it was most likely an officer or a SGT; He was the guy who had the authority of command at least on some level. The set up was also used by anyone who could get it of course and was a huge comfort to men who had main weapons slow to deploy or useless at close range, like a mortar or bazooka. And of course every paratrooper could use one when their M1 was taken apart in a jump bag and they found themselves in the vulnerable moments after landing on the DZ. While current products that fill the same role are better, the attraction I have for the old ” pistol belt and 45 automatic ” is still strong and I often will wear it with a plain Gov model M1911 when hiking or doing chores around the property just for the fun of it and the feeling of history it give me. I have had this original J.A. Show belt since the 80s, Purchased from an old widow at an estate sell. The 1st aid kit is original as well. Recently I hit the jack pot with the WW1 era mint, never issued, 1918 magazine pouch. 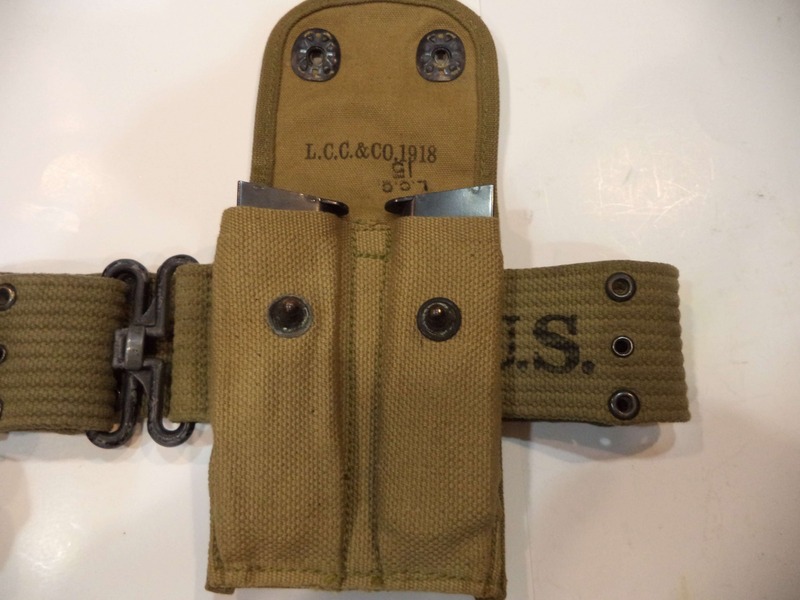 This pouch was widely used in WWII as well as the other model with a single push the dot snap often seen. While I have both, the 1918 model really is my pride, Being the Colt was adopted in 1911 and used shortly after in WW1. I like the idea of the canvas gear being as close to the guns birth in time. I can not put a finger on why, but I do. The 1918 pouch was carefully stored in some government depot for who knows how long, and is mint. 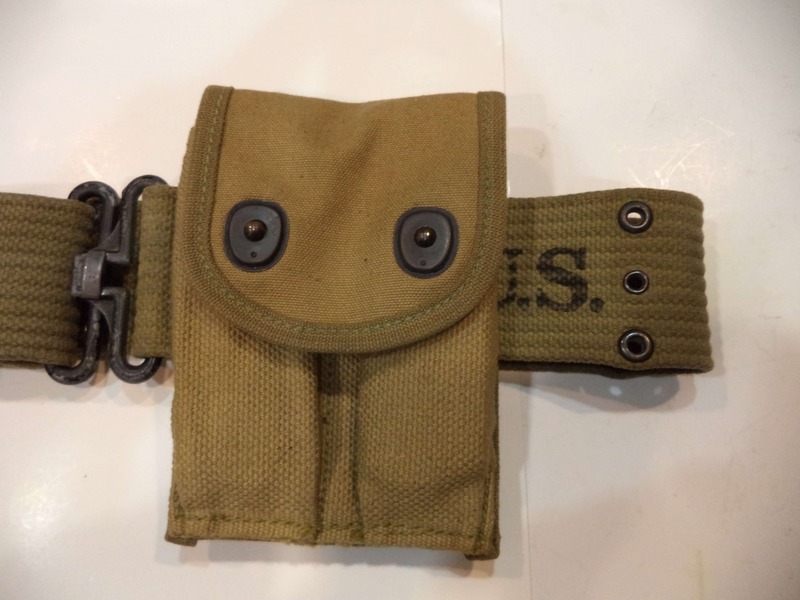 It has the snap to connect it to the pistol belt and keep it in place. The drab green/khaki color matches the belt nicely. the original US stamp is still sharp and clear on the belt as can be seen. Above. 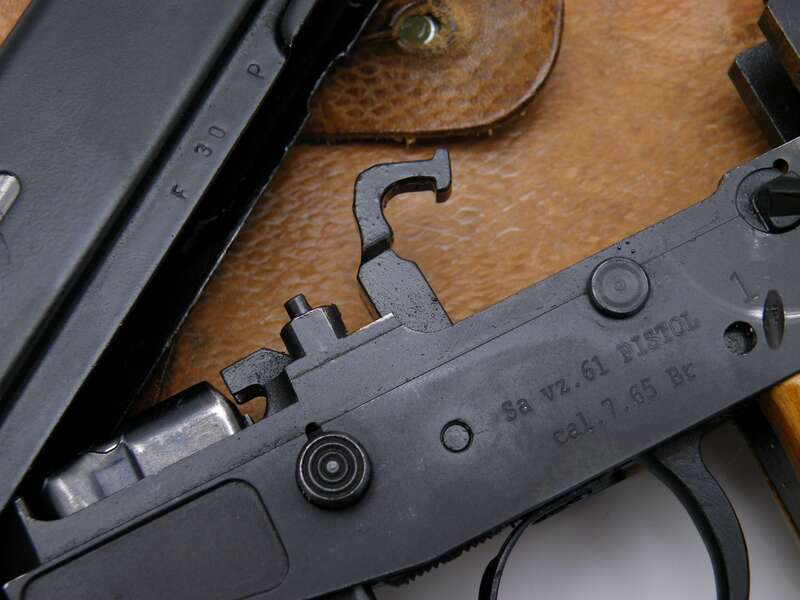 the picture shows how the two 7 round GI issue mags set in the pouch along with makers mark, model and date stamp on the inside flap still bright and clear. The brass metal fittings still have the black finish that cuts down on the shine of the brass. It won’t be there for long since I use this stuff often. 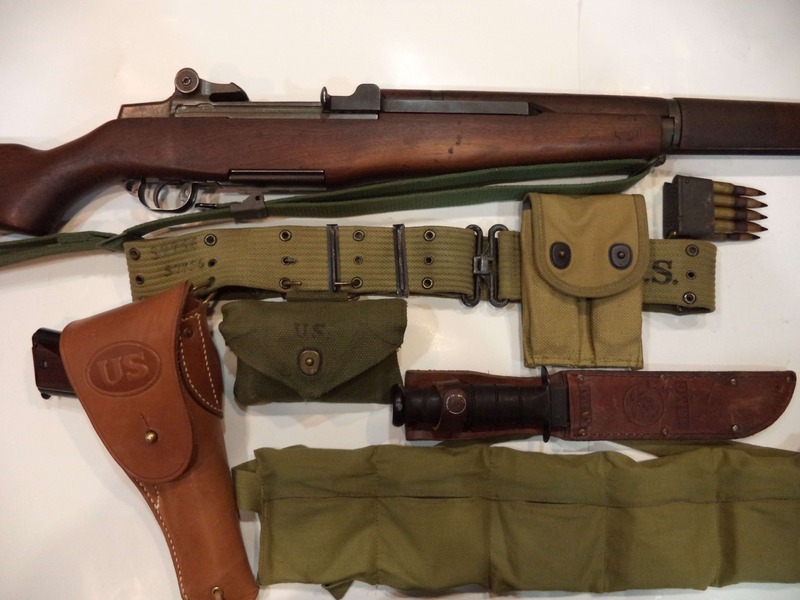 The combo of the items is classic and iconic in my mind, seen in hundreds of movies about killing nazi scum bags or commie north Korean human waves or older still, charging across no man;s land in France trying to make it to the krauts trench system. I don’t have a lot of original WW1 gear as I said, but what I do gather has a lot of value to me and meaning.